Kirsten Coelho, Transfigured Night (detail), 2017, porcelain matt glaze, banded iron oxide, dimensions variable; Courtesy the artist, Philip Bacon Galleries, Brisbane, THIS IS NO FANTASY + dianne tanzer gallery, Melbourne and BMGArt, Adelaide. Photo: Grant Hancock. There was a palpable sense of theatre when you made your way into the inescapably dark room that housed Kirsten Coelho’s installation, Transfigured Night. Presented en masse, Coelho’s well recognised white, sinuous porcelain forms created a series of landscapes bathed unapologetically in overhead light so as to sit in suitable contrast to the darkest of backdrops – a charismatic performance of the charming century-old technique of ‘chiaroscuro’ if ever there was one. Walking deftly, as if being sweetly summoned to move with the rhythmic repetitions of the objects themselves, you navigated the room with great anticipation, assessing each form as it gently shifted under the carefully calculated intensity of the spotlights. With every newly presented angle, greater awareness was raised to the individual objects themselves. Their form soon gave way to their apparent function, and the two together, presented over-and-over again in one great performance, cleverly illustrated the power of object as the ultimate vessel for communicating a greater theme. An object can be both functional and sculptural, and there is great delight in the way in which Coehlo simplifies shape; a certain elegance and purity is applied to each form and, indeed in this case, their overall formation. Placement and scale combine to create a visually successful dialogue with Coelho displaying an innate, understated feeling for her chosen materials; the installation therefore lying somewhere between the abstract and the referential. In essence, Coelho has transformed her singular vessels into something far more beautiful. This notion of elevation, or transformation, gives an intensity to this performance of form. As a ceramicist, Coelho is no stranger to the functional frameworks of her medium. Transfigured Night does however successfully question the common misconception of object as primarily functional. Experimenting with arrangement, light and space she openly challenges the way in which her audience experiences her work; familiar domestic objects become intricately and intimately connected. Objects that are used as a part of our daily rituals are no longer just merely admired, rather, their experimental, lyrical juxtaposition creates unusual visual planes and pictorial perspectives. In doing so, this chosen placement now redefines our spatial relationship to the works and greatly influences our visual and visceral reactions. Furthermore, the way in which light is both absorbed and rebounded by their matte, glazed surfaces contributes to their recession into the overall visual field, creating a somewhat harmonious tension between the installation and the space. There is no doubt that surface, size, weight and shape are all given the utmost consideration by Coelho, the assemblage as a whole bringing about the ultimate harmony of function and form. Kirsten Coelho, Transfigured Night, installation view, 2018 Adelaide Biennial of Australian Art: Divided Worlds, JamFactory, Adelaide. Photo: Saul Steed. Courtesy Art Gallery of South Australia. In addition to function and form, the extensive communicative capability of art and object have long been discussed and revered. As found within Coelho’s work, the power of association cannot be overlooked when considering the point where the visual and the sensory skilfully combine to reveal, what can best be described here as, the presence of a character. Like any well-developed character in any novel, play or film, the object’s character reveals itself slowly to the viewer through a series of intimate connections, communicating a range of emotions and encouraging highly personal responses. 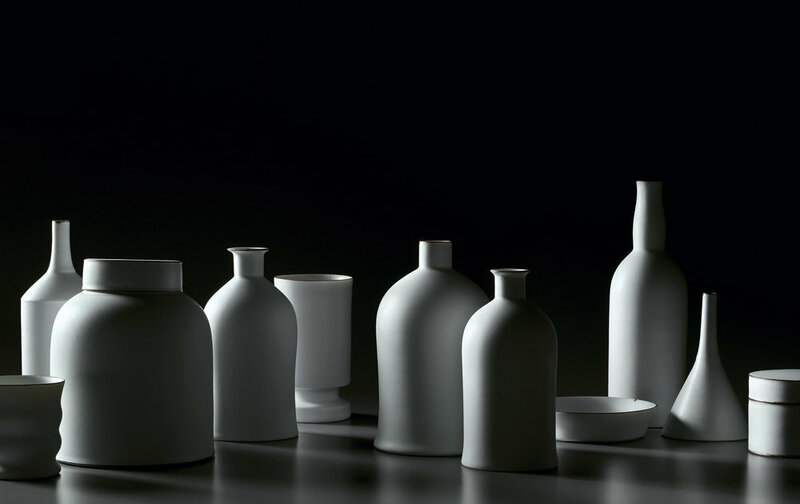 In Coelho’s case, by selecting these simple white porcelain shapes as her staple, and installing them as a group, she has offered a more complete act, than any solo offering might. Again, it is not only the object itself that offers modes of communication, but also the assemblage; a testament to the strength of an able supporting cast. Whilst not highly experimental, groundbreaking or exploitative of unusual combinations, Transfigured Night is a simple rendering of its title. In essence, Coelho has successfully elevated her vessels from something that is more commonly admired for its function or form, into something far more visually entertaining. This subtle transformation sits right at the centre of her performance. It sets the scene for Coelho to both capture and reward our gaze with a series of visual planes that ultimately question how we see simple, well-crafted objects of use in our very own homes. Perhaps too, this may question or influence the way in which we choose to display, interact and live with those objects; in turn revealing the presence of our own character to both ourselves, and to those who we welcome into our space. Are our objects, then, the ultimate expression of our own philosophies by which we choose to live? Kara Town is a Creative Director based in Adelaide, South Australia. She is the Co-Founder and Creative Director of stationery company AHD Paper Co., as well as Founder and Editor of online platform Object Of.